Big Fish Casino Review 2019 – 100,000 Chips FREE! Big Fish Casino has great looking games that are not limited to slots. Players can enjoy blackjack and roulette on the casino, or compete with other players at the Texas Hold'em poker tables. 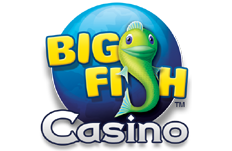 Big Fish Casino is arguably the best place on Facebook where players can enjoy free slots, blackjack, roulette, poker and other famous casino games. Big Fish Casino manages to make a good impression right from the very start. After logging in with a Facebook account, the app will present a great looking lobby with the main categories for the games. This makes it easy for players to choose from the available games and start betting within seconds. Unlike other big social casinos that only offer pokies, Big Fish also has other casino classics in its collection, such as Texas hold'em, blackjack and roulette. Also, the availability of these games does not depend on the account level. Another aspect that is appreciated from the get-go is the large welcome bonus. 100,000 chips for free should keep the action going for a long time and with the other bonuses available every day, it is likely that users will always have credits for placing bets. Of course, if you want to increase the number of chips you have or purchase gold bars, the online store is but a click away and it accepts payments of real money. The attractive casino doesn’t overlook a lot of things and so players can expect to find great coverage when it comes to mobile gaming. In fact, Big Fish Mobile Casino is available with the help of free downloadable apps on all of the big devices on the market, including Android phones, iPhone and even Kindle devices. Having the social casino available at any time will make it easier to collect the various bonuses available throughout the day and get some rounds going at any time. As far as its reliability goes, Big Fish is definitely a name that users can trust. It has a long history on Facebook and it continues to get better with the help of new games every year. All information shared with the operator is stored securely and encrypted. Online payments on the app and on the mobile platform are safe since they are done through Facebook and the respective mobile stores for the different devices. You can choose what to share on Facebook with friends and if the casino is allowed to post on your timeline with special offers. So far, the Big Fish Casino review is definitely looking good. The free journey at Big Fish Casino starts with a welcome bonus of 100,000 chips. This large amount will make sure that players can check out the games and never have to worry about the balance. Given the fact that line bets at level one only go up to 25 chips, spinning the reels in your favourite online pokies can be done for a very long time. A chip bonus is offered every 31 minutes and can be collected with a simple click. The size of the bonus depends on the account level so while it starts at 2,000 chips, it can easily go up to keep up with the increasing betting limits. Once claimed, the bonus will take about half an hour to refill and it must be claimed in order to add the funds to the account. In the top left corner, Aussies will be able to see the current level. This can be increased by betting on the games and getting experience points. A higher level comes with all sorts of perks that include gifts, bigger bonuses and higher betting limits. Becoming a VIP can be done by collecting VIP Points from real money purchases on the social casino. There are different tiers for the VIP program to reward players according to their expenses. Benefits for being a VIP at Big Fish Casino include multipliers for chips and gold, monthly bonuses, chip bonuses and more. Once a day, players can spin the Bonus Wheel to determine the prize. Multiplied wins and cash payouts are available on the wheel so it is very useful for keeping the action going. As for other promotions, the Facebook page is full of offers, giveaways and challenges. Registered users are also notified by email but it is always a good idea to follow Big Fish on Facebook if you want to get all of the perks in time. Play at Big Fish Casino with your 100,000 chips Now! Aussies will be able to enjoy different games for free at Big Fish Casino. This is actually a big plus that the operator has since not many social sites offer games other than slots. Of course, Big Fish has some great games in the slots department but it also has blackjack, roulette and even hold'em poker that can be played with other users on the casino for that competitive feel. There is also a game called Word Ace where players must form words with the letters they get in order to win. For the table games, multiple locations are presented that have different betting limits so that customers can choose the level at which they want and afford to play. All of the games are provided by Big Fish Games and the developer is always working on releasing new titles. These are usually pokies and some of the latest creations are themed after popular movies so they can be really fun. For example, you can play Baywatch online slots for free on the site and follow the main characters on their adventures on the spinning reels. Slots are packed with features and they are normally played with other players at the same time while sharing extra perks. Playing the free online casino games can be done at any time and most importantly from anywhere. Thanks to the Big Fish Mobile Casino apps, players can stay connected and not miss on any bonuses. The software developer makes sure that the games look and work the same, while fitting on smaller screens with better controls to match the touch devices. Apps can be downloaded for free form the respective online stores. iPhone and iPad users will find Big Fish Casino on iTunes, while those playing from an Android smartphone or tablet can just go to the Google Play Store to get the app. In addition, there are apps for Big Fish Casino games on the Amazon App Store for betting from Kindle devices. Regardless of the operating system, it only takes a few seconds to install the mobile casino app and you can then connect with the same Facebook account to continue playing for free. The payment options accepted can depend on the platform when it comes to Big Fish. This is because the operator accepts purchases on its official website, on the Facebook app and on the mobile apps. This can result in big variations of available banking options for each player based on location and device. However, it is safe to say that users will be able to buy chips and gold on the casino with debit and credit cards. Visa and MasterCard are the most frequently used ones. Other card issuers can be available as well and some customers can even use Bitcoin to make purchases online when it comes to Big Fish. For currencies, the story is pretty much the same and USD seems to be the primary option. GBP and EUR can be used as well but this can depend on the banking option. Keep in mind that this is only for payments since withdrawals are not possible. Although Big Fish Games has local sites in different languages, the Big Fish Casino app on Facebook is only available in English. Changing the language of the platform will not affect the social casino. Australian players should be happy with English being the default setting. Customer support is still in the works. The section of the Facebook page is not yet ready and players can go to the website of the operator to ask questions via email if needed. Another option is to just post on Facebook and maybe someone from the staff will respond with an answer. Big Fish Casino tries to please everyone. It does this with the help of different types of games and large bonuses that make sure it is possible to play them for hours and hours. With that being said, there is still a challenging aspect that makes things exciting since players are encouraged to get higher levels in order to unlock different features. This is best seen in the locations for the table games where the limits restrict customers based on their betting balance. It is however pretty easy for frequent players to move up the ladder and the payment option is always close by if needed. Another aspect of the Big Fish Casino review that left a good impression is the mobile platform. Multiple apps cover all sorts of devices for betting on the move and staying connected to friends on this social casino. While support is not ideal, it will most likely never come up since everything runs smoothly. In conclusion, players from Australia can find some awesome gaming options at Big Fish.